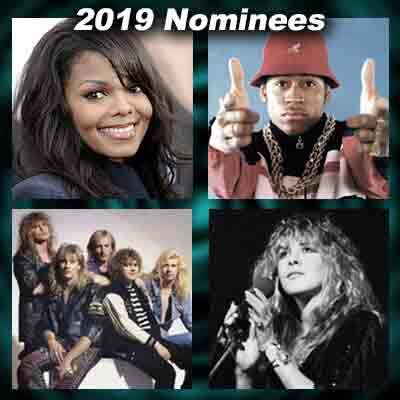 Criteria: 2019 Rock And Roll Hall Of Fame Nominees. Names are in alphabetical order. By 2019 - thirty three years after it began - the Rock 'n' Roll Hall Of Fame has long since lost any chance to serve as an accurate reflection of rock history, something all but guaranteed by the methodical manner in which a handful of select power brokers have entrenched themselves in positions to ensure their personal worldview is reflected in everything the Hall does. Discarding any pretense of objectivity in what they want to see honored, the powers-that-be have assembled a demographically homogeneous Nominating Committee to act as their surrogates, then all but guaranteed them lifetime spots in the room with the expectation that their like-minded tastes will result in a ballot the higher-ups will approve of, heavy on white acts from the 1960's and 70's which reflect their personal tastes as shown through years of reaffirmation. The ballots will have a handful of artists who break that mold, maybe an act from long ago, a few black artists, and someone from a small but vocal cult to keep the criticism from those corners to a minimum, but knowing all the time that the larger voting body will roundly ignore those options and go with the names most familiar to them - IE. their peers. That's the twisted genius of this process. By stacking the deck in favor of certain types of artists from a specific era and background it means those styles and eras will be rewarded disproportionately. Once somebody is elected they too become a part of the voting body and as their numbers increase so do the chances that the lesser lights from those realms who still remain will make it in on the next ballot over far more successful, influential and impactful artists from eras and styles outside of the dominant group of past inductees. Nothing has changed on this ballot except the names. The slots they all fill are the same from year to year and until the power structure of the Hall itself is toppled and the house is cleaned from top to bottom then nothing will change next year, or the year after, or the year after. On the ballot for the second time, The Cure will likely benefit from the recent influx of inductees from Great Britain where the group is far more highly regarded than in the United States, giving them a deeper pool of likely voters to cast a ballot for them. They do have decent enough credentials that they shouldn't need a more sympathetic voting body to at least give them strong consideration. Their influence on the bleaker sounds of the 1990's is their most notable achievement, but just one huge mainstream single in the US might make it a tough call for those voters unaware of their far greater success within their field. If there is one change to the Hall's views in the last decade or two it's their softening position on the formerly maligned subgenre of hair metal. Once thought to be a shallow decadent music that appealed strongest to teen girls who wrote the individual group members names on their stonewashed jeans in the 80's, the need for more artists from that decade to fill in spots on the ballot once reserved for 60's acts that have been depleted by induction over the years has opened up the door for this area of rock. If anybody is deserving though it's certainly these guys who have some of the biggest selling albums of all-time and overcame a lot of personal tragedy over the years to make them compelling figures. It's hard to believe this is their first time on the ballot as they would seem to be an ideal choice for the Hall in that they're a widely known group from the 1970's with plenty of modern recognition thanks to their vast influence on electronic sounds and have enough hits to meet the normal standards for commercial success as well. Their nomination might be intended by the Hall to give voters a different name in this style to consider after the arguably more qualified Depeche Mode failed to get in the last few ballots., the hope being that they might open the door for others in the same basic field. The single most deserving eligible solo artist yet to be inducted, her exclusion to date seems to be the result of demographic preferences, not only with the voters but also the media who haven't treated her previous nominations with the same type of headlines that other big names have received. By any measure her credentials are inarguable - more hits singles than any artist on the ballot, far more album sales, way more influence thanks to popularizing New Jack Swing, a style which got so big thanks to her they stopped calling it that altogether and just called it mainstream black music in the 1990's. It's not as if she's lacking name recognition either so she should've been inducted the first minute she was eligible and there's absolutely no defense for someone not checking her name off this year. One of the more frequent nominees in recent years who are still waiting for a call, but they're an unusual case as the relative anonymity of their members robs them of the kind of recognition that often helps borderline groups who have a big name in their midst. They're also hurt because the experimental nature of their music meant they had no real singles success to help their cause, though their hole card is massive influence. There's also always a chance that they could split the vote with Devo who had more success in a similar style, but Kraftwerk were the originators which counts for a lot and most acts with multiple nominations get in eventually. We're approaching the point where solo rappers should start dominating the ballot soon and so to keep rejecting the first enduring solo act of the field is disgrace. Not only did he help to popularize rap in the mainstream as a teen in the mid-80's but he shaped the emerging sounds in a myriad of ways and then unlike most of his competitors from that era he kept evolving as the hip-hop styles continued to change over the years. He also became one of the first rappers to have his success translate into a broader career in other entertainment fields where his name recognition today remains far stronger than almost anyone from his generation. Another who is long overdue. Groundbreaking proto-punk band whose attitude defined the style to come. Like many in that sub genre they were without much commercial success but commanded a huge underground following with one near-immortal live album to their credit which launched their career. In the process they completely altered the image of Detroit music, which had been dominated by Motown's accessible style, but now took on a nastier edge thanks to them. As one of just two 60's era names on the ballot they could benefit from cornering the market on those votes. This has to be a hoax, right? I mean, Stevie Nicks is a great artist but she's already IN the Hall Of Fame with Fleetwood Mac. She's had a successful solo career as well, but when her biggest hits all came in the form of duets with prominent male singers from other well known bands, is that really a solo career? She may have had some iconic songs by herself but it's not as if they will be her legacy. Is she really in need of an additional honor? Getting in a second time should be reserved for those whose solo work equals or surpasses their work in a group, which hers does not. But wait, she was friends with and did songs with Tom Petty who died this past year, so of course she'll get in to sing a tribute on stage for him. Should've seen it coming, the fix is in, but that's not your fault, Stevie. Each year it seems there is somebody nominated who sticks out at first glance because you'd never expect them. This year there is absolutely no debating who that figure is as there may have been no nominee in 33 years more out of left field than John Prine. He certainly doesn't have rock credentials, even if he has the respect of those in the field for his eclectic work in country-derived styles dating back to the early 70's. A tremendous songwriter whose work is richly rewarding, but considering the sheer number of massively important rock artists dating back to 1947 who have yet to be acknowledged at all, the decision to nominate Prine reeks of the Hall's desire to be applauded for a quirky choice. One of the most obvious newly eligible names to make last year's ballot turned out to be one of the most surprising oversights when the votes were counted as this highly regarded group fell short. The Hall can only do so much deck stacking and perhaps they underestimated their archaic voting body's lack of awareness for any act that was still upright in the 1990's, let alone churning out some of the most acclaimed music of that era. So they're back for a second look and their odds should improve some as long as the voters got the memo along with their arthritis medication the Hall sent out. They may not be a slam dunk vote but they're in the top three candidates if it went solely by merit. Nepotism is the practice of those in positions power giving jobs or accolades to friends or family members who otherwise haven't earned them. This is the second straight year RATM have been on the ballot which not coincidentally coincides with their own lead guitarist, Tom Morello, being on the nominating committee. Does that count as nepotism, or is it just good old fashion conflict of interest? Either way it completely invalidates their candidacy which is good but hardly great. As long as the Hall is allowed to be so brazen in their systematic lack of impartiality it reduces the award to an utter joke. Should they get in and actually appear on stage to accept this "honor" it will be done with absolute dishonor by the group's members. First time nominee that seems like yet another effort to keep the focus squarely on the 1970's so the Hall doesn't have to deal with more recent eras. One of five British acts on the ballot they too had far more success in their home country with ten Top 10 hits while only scoring one Top 40 hit in America. As leaders in the art-rock movement though they have some influence but had they been nominated when first eligible twenty years ago its doubtful they'd have drawn much support. Now with two decades worth of far more deserving candidates eligible who are being roundly ignored so the Hall can dredge up another older act this comes across as an all too predictable reach by the aging committee. One of the Hall's biggest oversights had gone years of being eligible without so much as a nomination and then when they finally had that rectified starting in 2012 for their first of now five appearances on the ballot they've had the misfortune of appearing under different names. Twice Chaka Khan alone was nominated for her solo career in between two appearances with the group she so memorably fronted throughout the 1970's. Since they are the greatest rock group of that decade not yet in, and far more qualified than most of the recent acts from that era who've made it, they are in desperate need of an induction… and then we can focus on Khan the solo singer for a second induction. One of many conceptual failings of the Hall over the years is how to deal with those figures who don't fit neatly into their categorizations, specifically those who were both an artist in their own right and a songwriter and producer for others. The Hall rightly wants to credit multi-talented figures, but in what way? Todd Rundgren didn't do enough as an artist to make it in under that designation, sandwiching a decent solo career between two stints fronting fairly minor groups. He did however get most of his acclaim in production work for others and so that's the role he should eventually be inducted under, but since this is the Main Performer category his credential score under that designation will suffer and he should be passed over for those more qualified as stand-alone artists. With seemingly few critically acceptable 1960's acts left to induct for an aging nominating committee who grew up during that era we've seen a few personal favorites of the committee members be nominated lately in a last ditch effort to get them in. None have been pushed harder than The Zombies by Steve Van Zandt. While they had a few stray hits and one acclaimed album to their credit, their total body of work is too insignificant to make them more deserving than the litany of early rock acts (1947-1954) and more recent (1984-1993) artists yet to even be considered. But this is the Rock Hall in a nutshell as the interests of a few in that room are constantly allowed to take precedent over the objective credentials of those outside their personal tastes. That makes this nomination a fitting way to close out this year's ballot as it's yet another glaring example of that systematic failing which dooms to Hall to historical irrelevancy. It goes without saying that each year you'll be disappointed with who Rock 'n' Roll Hall Of Fame nominates, or rather who they don't nominate. That it's always the same demographic biases of their constituency that are responsible for the most egregious oversights you'd think it'd be easy enough to fix by overhauling the committee that chooses the candidates in the first place. But no, they'll be there until they die, or at least until The Hall itself dies off from their robbing it of any legitimacy. The intentional blind spots within that all-important nominating committee aren't hard to see. First time eligibles this year had to release music in 1993, meaning Snoop Dogg and Outkast were both obvious selections. Neither is here of course because to do so it'd mean the Hall would violate their standard "one rap act" edict, even though hip-hop has clearly been the dominant form of rock music since the mid-1980's. Their being passed over this year also means that the likes of Eric B. & Rakim, A Tribe Called Quest, Big Daddy Kane, De La Soul, Salt-n-Pepa, Ice Cube and dozens more deserving names will be pushed further down the list of probable nominees in the future. Though nowhere near as deep with candidates as rap is, heavy metal faces a similar quota of just one act per year being considered, if that, meaning Iron Maiden, Motorhead, Judas Priest and Megadeth have to hope their retirement communities will organize a field trip to the ceremonies should they ever get around to inducting them down the road. The alt-rock movement has gotten a few one-off nominations recently but no consistent push either, making for a backlog there as well, which is typical of The Hall's ongoing neglect of the most recently eligible fields of rock. Not surprisingly nine of the fifteen names on the ballot came of age in the 1960's and 70's, which is alarming because... a) the best 60's and 70's acts have already made it years ago, and... b) they've barely scratched the surface when it comes to honoring the best 80's and 90's artists. If you think this ISN'T because of who is on the Nominating Committee but rather it's merely because they want to "get to" all of the qualified names while they're still around, consider this: They never afforded the same gushing respect for the 1950's, a decade that has been far more neglected by the Hall over the years. That trend continues this year as once again Johnny Ace, The Dominoes and Chuck Willis are ignored, as are The Clovers, Jesse Belvin, The Spaniels and Larry Williams who've never even been nominated once in three decades. And let's not get started on the artists like Roy Brown, Wynonie Harris, Amos Milburn, The Ravens and Paul "Hucklebuck" Williams from the late 1940's, an era they've all but refused to acknowledge having even taken place since that came before rock crossed over into white America. I mean, why would a Rock 'n' Roll Hall Of Fame want to waste time inducting the guys who actually INVENTED rock 'n' roll?!?! No, while it's true you can't ever be surprised by what The Hall Of Fame does, somehow you can still be disappointed. Hope dies hard I guess and each year you hope that they will work to correct their disproportionate demographics and bring new blood into the corridors of power, but we know they never will. You also hope that instead of focusing intently on the same narrow field of vision they'll widen their view and look to single out those from areas they've never properly addressed, but again, as they've shown by now, it's obvious they never will. So about the only thing you CAN count on with The Rock 'n' Roll Hall Of Fame is that each and every year they'll do the wrong thing for the wrong reasons and give the same wrong excuses and explanations to justify it all. Along those lines now that the great Big Jay McNeely died at the age of 90 this September, a revolutionary artist who was a towering figure in rock's earliest days when he essentially created the entire showmanship aspect of rock and who was deserving of induction for the past three decades without ever receiving so much as a nomination, it'd be exactly the kind of cruelly ironic touch the Hall is known for to give him some sort of posthumous honor this year. Why is that, you ask? Because - to their way of thinking - now he won't be around to mess up the ceremonies by appearing there in person.